Journey to the centre of the earth with Doug McClure and Peter Cushing. The Victorian scientists are drilling into the earths's crust with an Iron Mole. But when the test machine goes awry, they wind up in the subterranean fantasy Kingdom of Pellucidar. Amidst the twisted vines and lava flows, the adventurers encounter a wired civilization enslaved by the Mahars - a tyrannical race of giant prehistoric monsters. 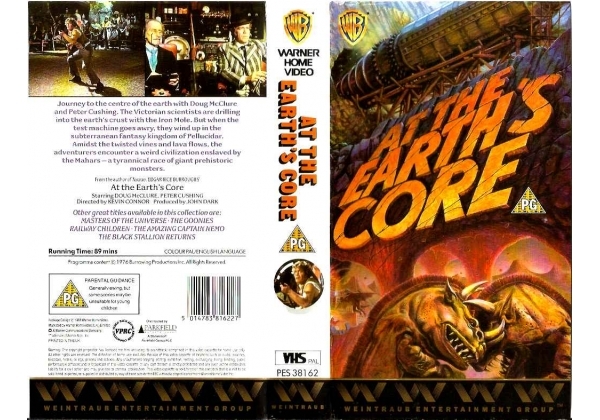 Or find "At the Earth's Core" on VHS and DVD / BluRay at Amazon.